Valid until 18 May 2019 Do not waste time! Staying longer at Hotel Daniele is cheaper! 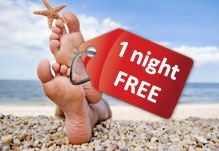 If you book a 7 nights stay, one night is free of charge! The offer is valid for stays from 08/03 till 18/05. Send us an e-mail with the discounted code "7=6" or book on-line filling the registration form you find in our web site.